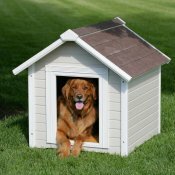 Unique Dog Houses Gallery ...spoil Rover with a dog house he can be proud of! Where Spoiled Dogs go to Shop! Unique dog houses provide not only more style, but all those extra bits of quality and year-round comfort your dog deserves. Here are some popular high quality dog homes for you and your best friend to look over. Don't hesitate to kick the tires -that is, follow the links for more details. Your dog is anxiously waiting to check out these great doggie digs, so without further ado, let's cut to the chase. Let's start with this solid pine Rustic Dog House shown on the left that your large dog will be proud to call home. With an attractive covered porch and weatherproof durable construction, Rover is assured of year-round comfort in any climate. 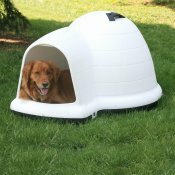 The dog house is designed with raised legs to protect the floor from moisture as well as keep it warmer and dryer inside. Maintenace is a snap through a removable door and assembly is quick and easy! Available in small, medium and large, the woodsy look of this Country Lodge House will blend in nicely with the backyard greenery as you can see. The roof has a weatherproof liner - a nice extra feature for rainy days when Rover decides to curl up and take a snooze. Along with the raised floor panel he is sure to stay dry. 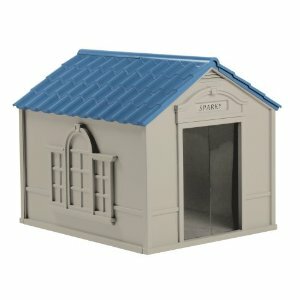 Among unique dog houses, the playful design of this one will surely bring back nostalgic memories to some! The whimsical appearance of the Ice Cream Dog House, is undeniably appealing - just like ice cream! But the house also boasts some excellent design features. It's high quality construction consists of Asian Fir for natural insulation and climate control. Large windows provide good circulation, a raised bottom maintains a dry interior, plus the top and bottom panels are removeable for easy maintenance. This one is sized for your smaller cutie, but there is also a larger one available. Your dog will be protected from the elements come rain or shine in the well-designed Pet Cottage dog house. Constructed of durable plastic this very stylish two-tone house has nice flow-through air circulation provided by vents placed on either side of the roof. The raised interior floor along with the elevation provided by the feet, assures your pet of a dry comfortable interior. For extra safety, the feet may be anchored to the ground or a deck. The cottage is very easy to clean and is suitable for medium sized dogs. Unique dog house built for two? Got two loveable pooches that are inseparable? Then this practical yet stylish premium Extra Large Wood House will keep them both happy and cozy. The pictured dog house dimensions are 73W x 39D x 42H inches; it's easy to assemble - hardware included and it comes with top quality vinyl doors plus the natural insulating quality of wood for weather protection. If you're a fan of western motif, then you will love the Saloon Dog House pictured right. Constructed from furniture grade finished wood in a natural tone, this "wildly" fun pet shelter is bound to be a conversation piece. Some of the nice features you'll get with this unique saloon house include an extended shaded deck, multiple windows for maximum ventilation and air circulation and slanted old west style roofs to ward off inclement weather. The dog saloon is suitable for medium to large beasts and the actual dimensions are: 32.75L x 39.75W x 77.25H inches. Here's a handsome and woodsy-looking, extra large Pet Log Cabin that any dog would find inviting. The house is built with cedar colored wood and a weatherproof shingled roof. Notice also that the cabin is raised off the ground keeping the floor dryer and warmer inside. This feature also helps prevent moisture problems as well as rot and insects. Choose from four available sizes: small, medium, large and giant. If you're seeking something reminiscent of charming chalets nestled in mountain meadows, look no further than this A-frame style pet house. When the weather conditions are more challenging, this large T-bone A-frame house will keep your pet(s) dry and cozy in style. With a handsomly designed green gable roof, faux window and extra large size, this pet shelter is a winner sure to be enjoyed by one or more dogs. together in the attractive Suncast Dog House with colonial styling. Very affordably priced, this durable resin house with vinyl door included, is designed with vents for comfortable air circulation and a removable roof for easy maintenance. Interior crowned floor has a channel around perimeter to capture moisture. If that's not enough, this house assembles in minutes and can be staked to the ground for extra stability and safety! Suitable for very large dogs according to the manufacturer. If your taste runs a little more to the classic styling, this Pets Cozy Cottage Dog Home is sure to appeal to you. With the durability of plastic double wall construction the cottage will keep Rover comfortably cool in summer and easily fend off the elements in winter. Assembly is a snap and the surface is wash and wear! 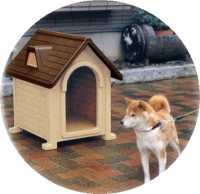 Among the unique dog houses to consider is the The Petsfit Dog House. This house definitely has strong eye-appeal with its very custom-looking design features. The slanted roof extends over the outside porch area and doorway protecting it from adverse weather, while the decorative window allows Rover to enjoy some fresh air while snoozing inside. The shelter is made from cedar wood, a known insect repellent, and has a raised floor to not only keep it dryer, but also deter bugs from getting cozy underneath. With an asphalt shingled roof that can be opened for cleaning and plastic feet - both waterproof, this pet home has it all. In fact, it's nothing short of dog heaven! Available in different stains and to suit pets of different sizes. If you like a striking contemporary design plus the durability of plastic construction, the Step 2 Tuff-N-Rugged modern doghouse is a good choice for you. Made in America for dogs up to 125 pounds, its features include the luxury of double-walled insulation and adjustable ventilation. With the addition of an optional door, your pet can enjoy for year-round climate control. Owners will appreciate the fade and chip resistant paint, as well as the easy assembly and no-sweat maintenance. During the colder times of year, any dog will appreciate the added bliss of a heater for his outdoor house. Take a look at the Akoma Hound Heater Deluxe Dog House Furnace to warm up your pet's shelter and give yourself the peace of mind that they are protected when the temperature drops. For your dog's safety and comfort this energy efficient heater is thermostatically controlled so it maintains the chosen temperature and only comes on when needed. Plus, an internal heat shield protects pets from getting burned, while the electrical cord has a metal cover to prevent chewing. 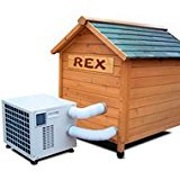 For year-round climate control, you can take your dog's quarters to a luxury level with this Outdoor Portable Heater and Air Conditioner that can be attached to your dog house. The unit has programmable controls that allow you to adjust the temperature and humidity level to keep your dog comfortable summer and winter.